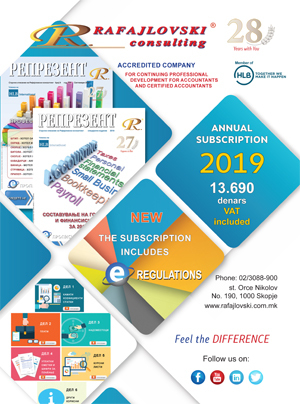 In this domain, the team of Rafajlovski Consulting constantly and accurately advises you about the legal regulations concerning taxes and accounting, as well as their practical daily application, the value-added tax, corporate income tax, personal income tax, customs, excise, with one word complete accounting operations. All of this is available to our clients at any time, including the possibility for mobile communication. For our clients' needs, the members of the expert team of Rafajlovski Consulting with passed bar exam, perform legal representation in the areas of business law. Representations are made pursuant to the applicable legislation of the Republic of Macedonia, based on the Law on Trade Companies, Law on Obligations, Law on Labor Relations, Law on Pension and Disability Insurance and other laws. In our company you will find the relationship between the law and economy which basically represents the business law. As pioneers in the area of Law on Trade Companies, as well as in the area of financial and accounting policy, Rafajlovski Consulting prepares all legal acts that represent the basis for all business activities of the companies. Beside the acts for registration of companies, we prepare acts in the area of accounting policies, financial policies, management and business plans, human resources organization, information technology organization and market research for the needs of our clients. We perform all kinds of registration and amendments to registrations of companies in accordance with the Law on Trade Companies. Rafajlovski Consulting has a long term experience in companies; evaluation projects. The evaluation is performed by certified appraisers in accordance with the positive Macedonian legislation.